State Superintendent of Public Instruction Jack O’Connell visited Lee Elementary School and Polytechnic High School this week to learn about the schools’ successful practices. Earlier this month, O’Connell mentioned Lee Elementary in his State of Education Address for making strong academic achievement gains and holding high expectations for character and behavior. 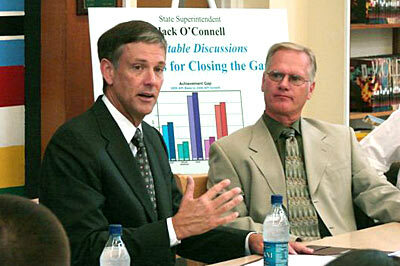 At Poly, O’Connell participated in a roundtable discussion on closing achievement gaps. The discussion included teachers, students and administrators from Poly, Lee and Hill Classical Middle School.